Nintendo is a known bully when it comes to fan-made games which mention its characters or copy its plot. It has in the past initiated legal action against such fans who use Nintendo copyrighted material in their indie games. However, one such developer team has decided to hit back at Nintendo. The developers behind a game called No Mario’s Sky based on Nintendo character have decided to rename their game as DMCA’s Sky after being threatened with legal action by Nintendo. Sadly, that couldn’t stop it being withdrawn from triannual game coding competition, Ludum Dare. 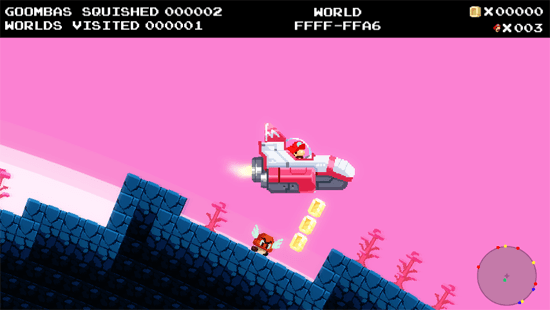 For the uninitiated, No Mario’s Sky was based on one of the most famous characters from Nintendo stable, Mario. Mario has been a milk cow for Nintendo since its release in 1981. Since his debut as Jump Man ” in the arcade game Donkey Kong on July 9, 1981, Mario has been one of the best-known characters in gaming circuit. The Mario franchise is the best-selling video game franchise of all time with over 210 million units of the overall Mario series of games have been sold throughout the world. However, Nintendo is very possessive about its lucky mascot. Just like many big technology companies, Nintendo sees its intellectual property rights as its most valuable asset. As a result, the company is cracking down on anyone using Nintendo characters without permission, from fan-made Metroid clone AM2R to Pokémon Uranium. The developers behind No Mario’s Sky also felt the Nintendo ire when Nintendo of America attorney Brian Sniffen sent a legal notice against their game which was just a few hours old. ASMB Games (Alex McDonald, Sam Izzo, Max Cahill, Ben Porter) and their creation No Mario’s Sky, a game featuring “exploration and survival in an infinite procedurally generated universe.” took just four hours to piss Nintendo and threaten them of legal action. “We represent Nintendo of America Inc. (“Nintendo”) in intellectual property matters. Nintendo recently learned that content available at https://asmb.itch.io/no-marios-sky infringes copyrights owned by Nintendo. This notice is provided pursuant to the Digital Millennium Copyright Act, 17 USC § 512, and itch.io’s Terms of Service,” Sniffen wrote in a DMCA complaint sent to ASMB. Unable to take on the might of Nintendo, ASMB immediately took the game down. Sadly that also had an effect on their standing at Ludum Dare. However, after initial scare, ASMB decided to fight back and decided to relaunch the game as DMCA’s Sky. It remains to be seen whether Nintendo will go after DMCA’s Sky as well but ASMB lost out a golden chance to make it to Ludum Dare.